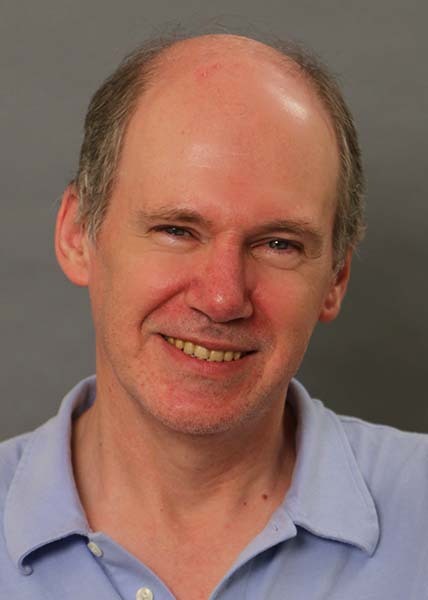 John Stufken has joined Arizona State University as the inaugural Charles Wexler Professor in Statistics at the School of Mathematical and Statistical Sciences. “Arizona State University has been very encouraging of collaborations, and through the expansion of our statistics department, we hope to make many new connections both within the campus and beyond,” Stufken said. Stufken joins ASU from the University of Georgia, where he served as the head of the Department of Statistics for 11 years. During his tenure, he helped expand the department to raise national recognition. Stufken is the first Charles Wexler Professor at the School of Mathematical and Statistical Sciences, its inaugural endowed professorship. The professorship is made possible by a generous endowment from the estate of Richard “Mike” McDaniel, an ASU alumnus. McDaniel considered Charles Wexler a mentor, and he attributed many of his professional and business values and successes to the influence of his professors. Charles Wexler was the founding chairman of the Department of Mathematics at ASU. At the time of his retirement, he had accumulated 47 years of service, the longest period of faculty service in the university’s history. In 1977, the A-Wing of the Physical Sciences Complex was named after Wexler in appreciation of his outstanding service to the university. McDaniel greatly valued the influence of Wexler on his studies at ASU. Wexler encouraged McDaniel to get a doctorate in mathematics. Although he did not pursue this, he thought in his later years that perhaps mathematics would have been a good path for him. He noted that math, an intensive part of the electrical engineering curriculum, was challenging for him. He credits professors like Wexler for making complex subjects more understandable. He would go on to earn his master's in electrical engineering. As University of Georgia’s head of statistics, Stufken was one of the architects of the Modeling and Analytics Graduate Network, or MAGNet program, a partnership with State Farm. Participating graduate students earned paid tuition and financial compensation in return for spending 20 hours a week conducting real-life research on projects directed by State Farm. He hopes to collaborate with State Farm here in Arizona to create a similar partnership. Stufken previously served for several years as program director of statistics, Division of Mathematical Sciences at the National Science Foundation. He was also a professor at Iowa State University. A native of the Netherlands, Stufken studied mathematics at the University of Nijmegen, now known as Radboud University. He earned his doctorate in statistics from the University of Illinois at Chicago. He is a fellow of the Institute of Mathematical Statistics and the American Statistical Association, and is an elected member of the International Statistical Institute. Stufken’s research and teaching interests consist of theory and application of designs of experiments, including optimal designs for generalized linear and nonlinear models, crossover designs and orthogonal arrays. Are you a soon-to-be-graduate or student interested in graduate school? The Idealist Grad Fair is coming to the ASU Downtown Phoenix campus Oct. 14. Are you a soon-to-be graduate or student interested in graduate school? The Idealist Grad Fair is coming to the ASU Downtown Phoenix campus Oct. 14, and students will have the chance to interact with 43 exhibitors offering various graduate programs. The fair will take place from 5 to 8 p.m., in the AE England Auditorium. At the grad fair, students can learn about admissions requirements and application deadlines for graduate programs in a variety of fields, including social work, public policy, nonprofit management, international affairs, public interest law, social entrepreneurship and many more. To RSVP and for a complete list of exhibitors, visit www.eventbrite.com/e/phoenix-idealist-grad-fair-tickets-11148021031. 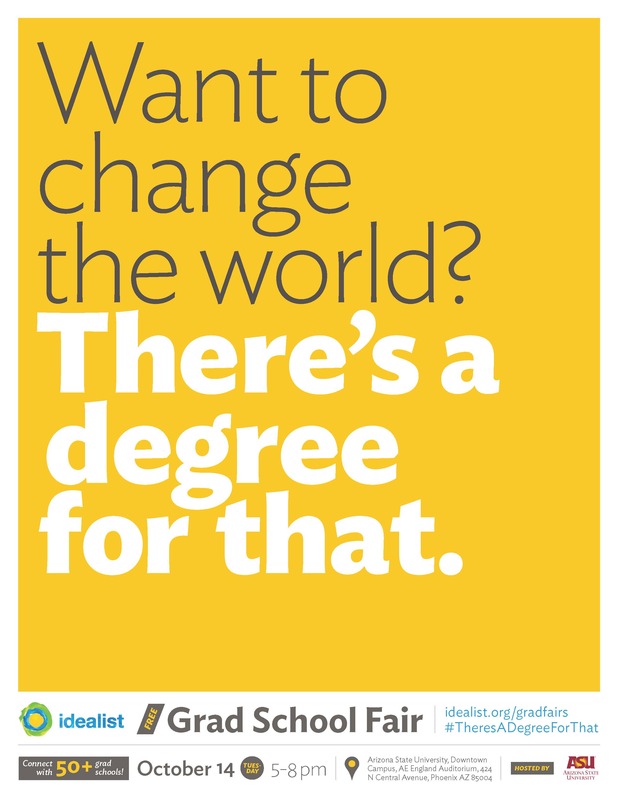 For more information, email gradfairs@idealist.org.